WCD Haryana Notification is out. 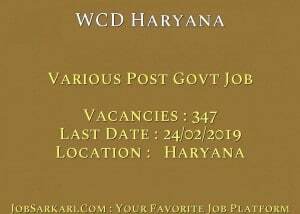 WCD Haryana is recruiting for 347 Various Post Govt Job Posts. You can check WCD Haryana - Women & Child Development Department Haryana last date, download WCD Haryana notification, visit WCD Haryana official website and check other WCD Haryana Vacancy details.Complete Vacancy and recruitment Details about 347 Various Post Govt Job vacancies in WCD Haryana are provided below by JobSarkari.Com only for you. Last Date of Apply Online. 24/02/2019. Consultant (Planning, Monitoring & Evaluation) Candidate Must Have Passed PG Degree/Diploma in Management/ Computer Applications/Computer Science or B. Tech/BE in IT/Computer Engineering or PG in Science with Formal Training on IT/computer with at Least 55% Marks and Having At least 3 Years Experience in IT/ICT Systems Implementation and Analysis. 01. Consultant (Health & Nutrition) Candidate Must Have Passed PG Degree in Nutrition/ Public Health/ Social Sciences/ Rural Development Community Medicine with At Least 55% Marks and At Least 3 Years Experience in Planning, Implementation and Monitoring of Child and Women Nutrition Programmes. For Applicants with PhD (In Nutrition Related Subjects), 3 Years of Doctoral Time Would be Counted as 3 Years of Experience. 01. Consultant (Financial Management) CA/ CS/ CMA (CWA) or MBA (Finance) From Reputed Institute with at least 55% Marks. And At least 3 Years Qualification Experience out of which 1 Year Should be in Government/ PSU/ International Agencies. Under Secretary(Pay Level-11) or Equivalent with at least 5 Years’ Experience of Financial Management /Budget/Government Treasury Accounting. 01. Consultant (Capacity Building & BCC) Candidate Must Have Passed PG Degree in Social Sciences/ Health Communication/ Mass Communication/Rural Development that includes Courses on Training/Capacity Building Management in Nutrition/Public Health with at least 55% marks At least 3 Years Experience in Planning and Implementing Behavior Change Communication and Capacity Building Interventions in Public Health/Nutrition Programmes. 01. Consultant (Procurement) Candidate Must Have Passed PG Degree in Supply Chain Management/ MBA with Specialization in Operations / Supply Chain Management At least 3 Years Experience in Application Maintenance / 4 Years Experience in Supply Chain Management and Procurement Planning. Candidate Must be Government Employee retired as Under Secretary (Pay Level11) or Equivalent with At Least 5 Years’ Experience in Procurement. 01. Accountant Candidate Must Have Passed PG Degree in Commerce/ Accounting/ CWAInter/CA- Inter with at Least 50% Marks At least 3 Years Experience in Accounting with Exposure in Budgeting & audit out of which 1 Year Should be in Government/PSU. Expertise in MS Office Including Word, Excel and PowerPoint. Candidate Must be Government Employees Retired as Accountant with at Least 5 Years Experience/Accounts Officer/Audit Officer with at Least 3 Years Experience. 02. Project Associate Candidate Must Have Passed Graduate in Computer Science or IT At Least 2 Years Work Experience in the Relevant Field Formal training in IT/mobile Applications. Experience in Working with Technology and Software Application Support. Previous Experience in Working with Front Line Workers of Government Department and Training on IT/Mobiles/Computer. 02. District Coordinator Candidate Must Have Passed Graduate or Certification/Diploma in Computer Science or IT At Least 2 Years Experience in Application Maintenance & support. Good oral and written Communication Skills in Local Language. 21. District Project Assistant Candidate Must Have Paased Graduate Degree/Post Graduate Diploma in Management/ Social Sciences/ Nutrition, Minimum 2 Years Work Experience of Capacity Building, with Supervisory Skills Good oral and written Communication Skills in Local Language and Fair Skills in English 21. Block Coordinator Candidate Must Have Passed Graduate. At Least 2 Years Experience of Working with Technology and Software Application Support Good Oral and Written Communication in Local Language Mandatorily Local Candidates Should Be Engaged. 148. Block Project Assistant Candidate Must Have Passed Graduate. At Least 1 Year Experience of Working with Technology and Software Application Support Good Oral and Written Communication in Local Language Mandatorily Local Candidates Should Be Engaged. 148. Total No. of Post 347. 1. Written Test / Interview. 2. Candidate Need to Click on Apply Online Link As Given on Our Website. 3. Candidate Are Required Fill All the Details in Application Form And Need to Upload Scanned Copy of All Mandatory Documents. 4. Candidate Can Apply Online on Or Before 24th February 2019. Q. What is the Last Date For WCD Haryana Various Post Govt Job Vacancy ? A. 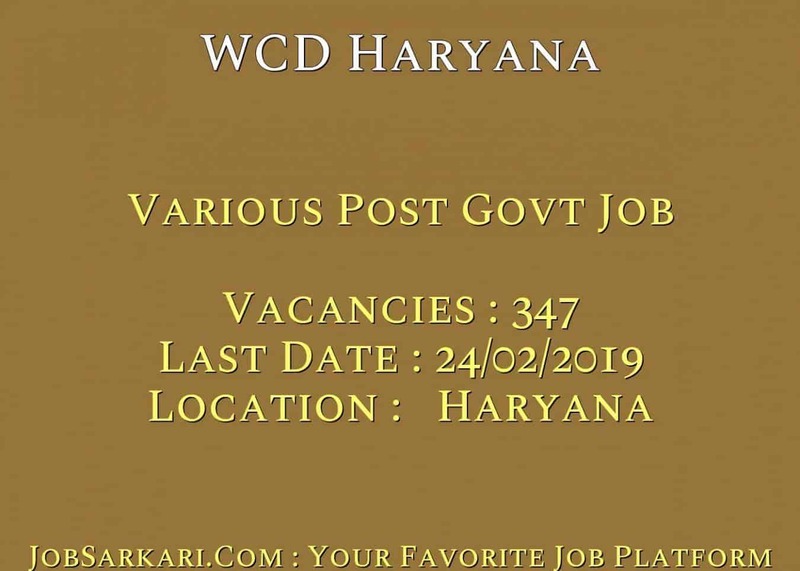 Last Date for WCD Haryana Various Post Govt Job Posts is 24/02/2019. Q. What is the Form Type of WCD Haryana Various Post Govt Job Recruitment ? A. The Form Type for WCD Haryana Various Post Govt Job Posts is Online. Q. How many vacancies are available in Women & Child Development Department Haryana Various Post Govt Job Posts ? A. There are about 347 Vacancies in Women & Child Development Department Haryana Various Post Govt Job Posts. Q. What is the Full Form of WCD Haryana ? A. Full Form of WCD Haryana is Women & Child Development Department Haryana .